Drake’s Duck-In, Columbia SC – Marie, Let's Eat! “Are we having barbecue for breakfast, or breakfast for breakfast,” Marie asked. Uh-oh. She’s onto me. Fortunately, I anticipated her desire, and picked a very old and much loved local restaurant for her to enjoy a chicken biscuit. We stayed the night at a very, very decent hotel at a very, very nice price. I really couldn’t believe how inexpensive it was in relation to the quality of the room. Then we were awakened by Reveille at seven in the morning. Fort Jackson was right behind us. I figure they give their guests a twenty buck break on the price to apologize for the disturbance. Somehow our son slept through it and all the way until eight, when at home he’s usually the one getting us up. The previous day’s car trip really must have worn him out even more than we thought. Well, this was the third and final day of the trip, and would be far less of a challenge for him. We left the hotel and made the short drive downtown. Happily, every Saturday morning, they block off some of the streets for a terrific market called Soda City. We had a really good time browsing before and after our breakfast. They hold the market every Saturday year-round, rain or shine. If we lived here, we would visit a lot, and strongly recommend that anyone visiting the city include it on their plans, even if, like us, you actually just came for a good breakfast at a really old quick-service restaurant. I’d been curious about Drake’s for years and it didn’t let me down. Daniel Boan and Matthew Bridges bought the business last year from Steve Rowland. Now retired, he had purchased the restaurant and building in the early 1970s from the Drake family. This place goes way back. It originally opened in 1907. I was unable to find a comprehensive history anywhere, but it has apparently had at least three locations in Columbia’s downtown. 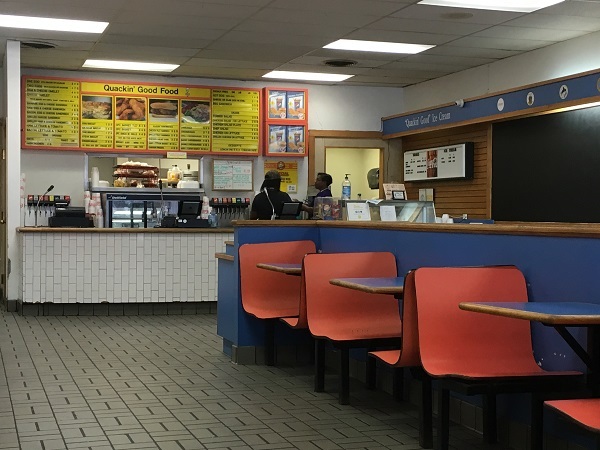 Sixty years ago, there was also a full-service sister restaurant, but it didn’t last. I understand that Columbia suffered the downturn that many old southern downtowns did in the seventies, but while many local businesses closed, Drake’s held on since Rowland owned the building. Since the city began rising from the doldrums of the mall-n-sprawl days, Drake’s has been a consistent destination. Today, the downtown is vibrant and pretty awesome, and I like it a lot. I also like this chicken. 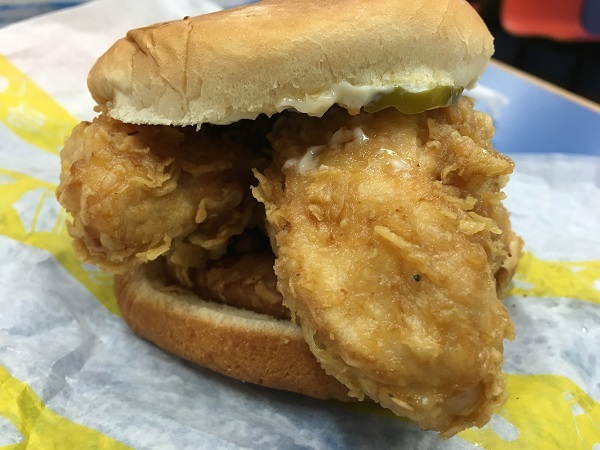 I have occasionally asked, on Twitter, where in Chattanooga to go for a great chicken biscuit. 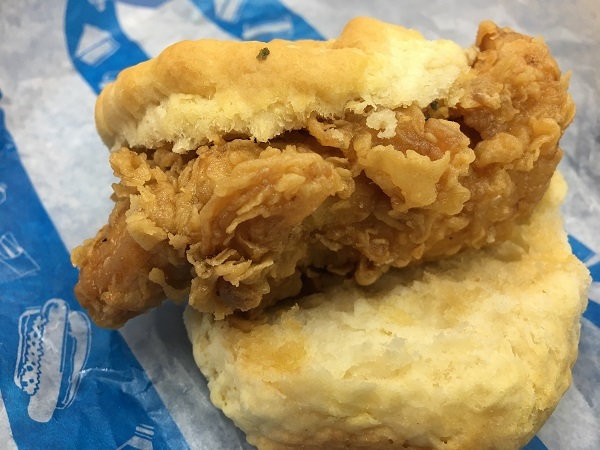 Normally, I’m good with a single bowl of cereal, or nothing, but once in a while, I want an awesome biscuit with chicken, or occasionally country ham. I have not found anywhere near me that’s even close to being as good for a quick breakfast as Drake’s. We got a couple of biscuits and one of their celebrated lunch sandwiches. They’re delicious. I bet this place gets unbelievably hammered on game day. I believe that very little about the interior of Drake’s has changed since this location opened. It looks like the inside of a fast food place that was state-of-the-art contemporary about four decades ago. Not as many people are as interested in vintage ’70s as they are vintage ’50s or earlier, but I enjoy the time-warp feel of the place. I hope that the “quackin’ good food” menu board will never be replaced by a widescreen TV. I understand that this place gets really busy, although this particular Saturday, while we were there, things were fairly slow. We had a couple of minutes to talk with the longtime manager, Edwina Harmon, and I told her that we haven’t found chicken this good in Chattanooga yet. My fingers remain crossed. I did most of the driving on this trip, but the leg of I-20 between Columbia and Augusta is one that I find particularly tedious, so Marie drove as we left Columbia – darn it, I really like this city – and I tried to catnap. I couldn’t; blasted Reveille was stuck in my head. See also Columbia Closings for photos of the long-gone Drake’s Restaurant from the 1950s. Do you enjoy classic adventure TV? I’m reliving some great shows from my own childhood with my five year-old son. Come join the fun at Fire-Breathing Dimetrodon Time! Posted on December 2, 2016 by Grant G.Posted in breakfast, chicken, columbia, south carolinaTagged breakfast, chicken, columbia, south carolina. 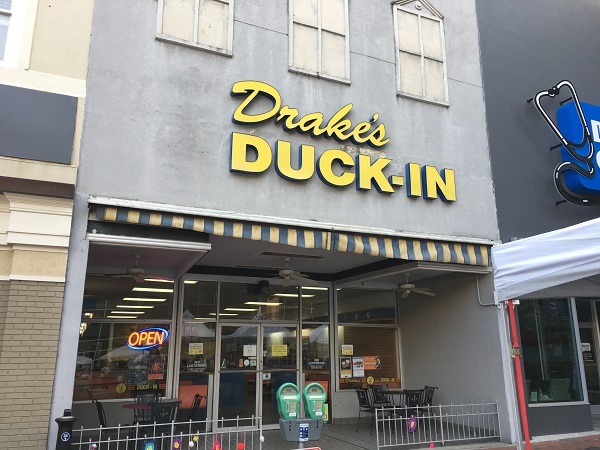 I’m in Columbia for the night, and while I was going to start the day tomorrow with Jackie Hite’s without having anything before, I think I’ll hit Drake’s Duck-in for a biscuit first thing. I wish I had had the recommendation before my trip here last August, because the biscuits I had on that trip weren’t too good. Went for a biscuit this morning. It was very good. I’m so happy to of gotten the recommendation. Thanks. I’m glad! I hope the rest of your trip is terrific. Drake’s is good, yeah, but I went to a place there called Eggs Up not long ago that I really enjoyed. Put that on your to-do list for your next visit!! Thanks for the recommendation! I wish we could make it back to Columbia more often. That had been the hope, once, but it hasn’t worked out that way. Maybe in the future!